FLEETWOOD DINER photo art print for sale FLEETWOOD DINER photo picture print for sale. FLEETWOOD DINER Ann Arbor art photo picture photographs for sale. FLEETWOOD DINER ANN ARBOR photo art photograph print photography pictures for sale. FLEETWOOD DINER Ann Arbor PHOTO ART PRINT PHOTOGRAPH of Fleetwood Diner for sale. Title for ordering this photo is: FLEETWOOD DINER HDR OVERCAST SKY. 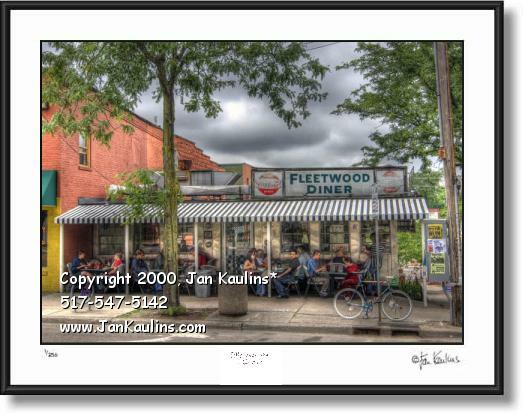 FLEETWOOD DINER ANN ARBOR PHOTO ART PRINT PHOTOGRAPH FOR SALE. Ann Arbor MI HDR photo photography art prints photos by artist photographer Mr. Jan Kaulins for sale. This Fleetwood Diner picture photo is of a legendary late night eatery in downtown Ann Arbor, Michigan. It has been a hangout and a haven for several generations of University of Michigan students and townies, and will hopefully be so for many more. Originally, The Fleetwood Diner was called The Dagwood Diner when it was moved from Toledo Ohio where it was manufactured (as a do-it-yourself kit) in 1948. It was re-named The Fleetwood Diner in 1971 and remains an Ann Arbor landmark. TO VIEW THE OTHER ANN ARBOR PHOTOGRAPHS AVAILABLE ON THIS ANN ARBOR PHOTO WEBSITE CLICK ON THE 'GO BACK TO...' LINK ABOVE THIS PHOTO NEAR THE TOP OF THIS PAGE. STOP BY AND SEE ARTIST PHOTOGRAPHER JAN KAULINS HAND COLORED BLACK AND WHITE ANN ARBOR, UofM, AND DETROIT PHOTOS FOR SALE AT HIS BOOTH #147, ON STATE ST. JUST SOUTH OF WILLIAMS ST. BY THE DIAG AT THE ANN ARBOR ART FAIR. ANN ARBOR ART FAIR ARTIST EXHIBITOR PHOTOGRAPHER BOOTH #147.